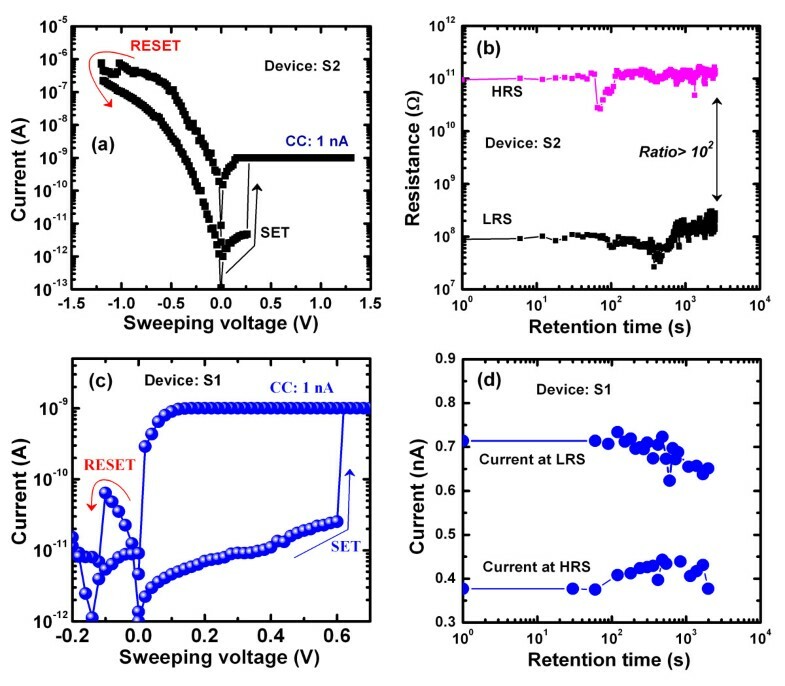 We demonstrate enhanced repeatable nanoscale bipolar resistive switching memory characteristics in Al/Cu/Ge0.5Se0.5/W, as compared with Al/Cu/Ge0.2Se0.8/W structures, including stable AC endurance (>105 cycles), larger average SET voltage (approximately 0.6 V), excellent data retention (>105 s) at 85°C, and a high resistance ratio (>104) with a current compliance of 8 μA and a small operation voltage of ±1.5 V. A small device size of 150 × 150 nm2 and a Cu nanofilament with a small diameter of 30 nm are both observed by high-resolution transmission electron microscope in the SET state. 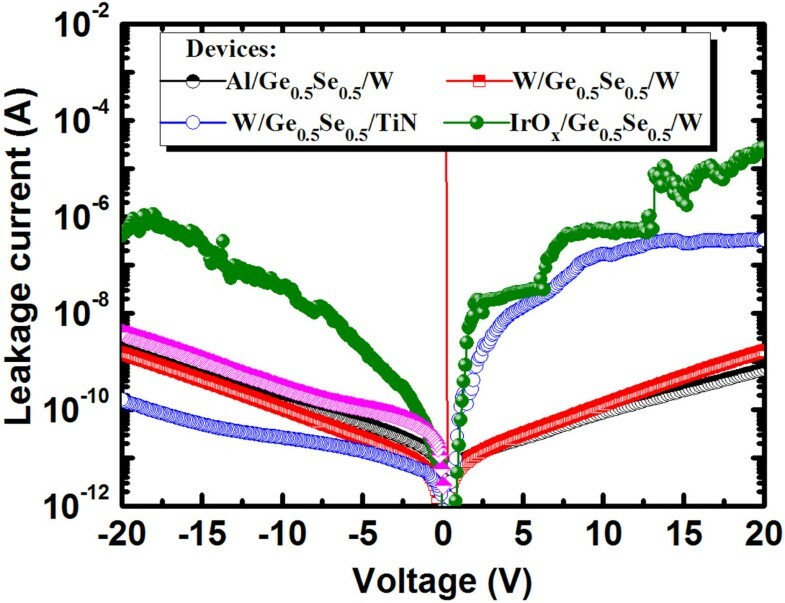 The Ge x Se1 − x solid electrolyte compositions are confirmed by both energy-dispersive X-ray spectroscopy and X-ray photoelectron spectroscopy. The switching mechanism relies on the smaller barrier heights for holes rather than for electrons; the positively charged Cuz+ ions (i.e., holes) migrate through the defects in the Ge x Se1 − x solid electrolytes during SET/RESET operations. Hence, the Cu nanofilament starts to grow at the Ge0.5Se0.5/W interface, and starts to dissolve at the Cu/Ge0.5Se0.5 interface, as illustrated in the energy band diagrams. Owing to both the higher barrier for hole injection at the Cu/Ge0.5Se0.5 interface than at the Cu/Ge0.2Se0.8 interface and greater thermal stability, the resistive switching memory characteristics of the Al/Cu/Ge0.5Se0.5/W are improved relative to the Al/Cu/Ge0.2Se0.8/W devices. The Al/Cu/Ge0.5Se0.5/W memory device can also be operated with a low current compliance of 1 nA, and hence, a low SET/RESET power of 0.61 nW/6.4 pW is achieved. In addition, a large memory size of 1,300 Pbit/in2 is achieved with a small nanofilament diameter of 0.25 Å for a small current compliance of 1 nA. Resistive switching random access memory (RRAM) devices have recently become promising candidates for future low-power nanoscale nonvolatile memory applications [1–3]. RRAM devices involving materials such as HfO x [4, 5], SrTiO3, TiO2[7, 8], ZrO2[9, 10], Na0.5Bi0.5TiO3, NiO x [12, 13], ZnO , TaO x [15, 16], and AlO x [17, 18] are widely reported. However, their precise switching mechanism remains unclear, despite being important for applications. On the other hand, other resistive switching memory materials exploit the migration of cations (Ag+ or Cuz+, z = 1 and 2) in solid electrolytes such as Ge x Se1 − x[19–21], GeS2, Ta2O5, SiO2, Ag2S [25, 26], ZrO2, TiO x /ZrO2, GeSe x /TaO x , HfO2, CuTe/Al2O3, Ti/TaO x , and GeO x . Resistive switching memory that uses Cu/ZnO/Pt , Ag/SiO2/Pt , and Ag/ZrO2/Pt  structures has also been reported recently. Further, recent studies also conclude that the growth of a metallic filament, which is at the heart of the conduction mechanism, is initiated at the Cu/ZnO (or Ag/SiO2 or Ag/ZrO2) interface and that its dissolution starts at the ZnO/Pt (or SiO2/Pt or ZrO2/Pt) interface, in contrast to previously reported results. Therefore, a better understanding of the switching mechanism based on the formation and dissolution of the Cu or Ag filament in solid electrolytes is required for future applications. In this regard, the Ge x Se1 − x (x = 0.2 to 0.4) solid electrolytes have attracted considerable interest. In these, mobile Cuz+ or Ag+ ions play an important role in the formation and dissolution of the metallic filament [19–21]. Furthermore, important benefits of using Ge x Se1 − x as switching materials are their 100% device yield and their ease of processing. Kund et al. 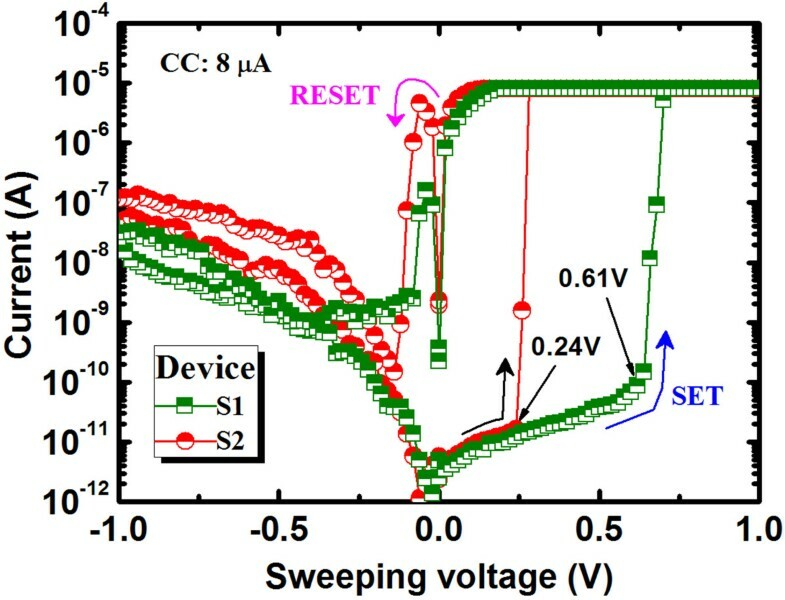 reported GeSe-based resistive switching memory in an Ag/GeSe/W structure with a current compliance (CC) of 10 μA and showing data retention up to 70°C. Jeong et al. reported threshold switching using Pt/GeSe/Pt structures. Although Se-rich Ge0.3Se0.7 (or Ge0.2Se0.8) solid electrolytes have been extensively studied [19–21, 29, 37], there are no reports on solid electrolytes with a low Se (or, equivalently, a high Ge) content, such as Ge0.5Se0.5, showing enhanced memory performance. The melting points of Se and Ge are 220.5°C and 937.4°C, respectively, suggesting that the thermal stability and the memory characteristics can both be improved by increasing the relative Ge content. In this study, we investigated an Al/Cu/Ge0.5Se0.5/W memory device with improved resistive switching memory characteristics compared to those of an Al/Cu/Ge0.2Se0.8/W device. They include the repeatability of switching cycles (>103), a larger SET voltage (VSET) of approximately 0.6 V (due to the greater barrier height for holes or Cuz+ ions), stability, and long AC endurance (>105 cycles) when operated with a small voltage of ±1.5 V. The composition of the solid electrolytes was confirmed by energy-dispersive X-ray spectroscopy (EDX) and X-ray photoelectron spectroscopy (XPS). The barrier height for hole injection at the Cu/Ge0.5Se0.5 interface (0.75 eV) is lower than that for electron injection at the Ge0.5Se0.5/W interface (0.91 eV), so hole injection dominates. The positively charged Cuz+ ions (i.e., holes) migrate and start to grow at the Ge0.5Se0.5/W interface and then start to dissolve at the Cu/Ge0.5Se0.5 interface. We investigated this process in terms of energy band diagrams. The barrier height for hole injection at the Cu/Ge0.5Se0.5 interface is also greater than at the Cu/Ge0.2Se0.8 interface (0.75 vs. 0 eV). This affects the migration of Cuz+ ions via defects as well as the formation and dissolution of Cu filaments in the SET and RESET operations in the Cu/Ge0.5Se0.5 solid electrolyte. Furthermore, we observe better stability in data retention in both the high-resistance state (HRS) and the low-resistance state (LRS) (over >105 s) at 85°C in the Al/Cu/Ge0.5Se0.5/W memory device compared to the Al/Cu/Ge0.5Se0.5/W device. 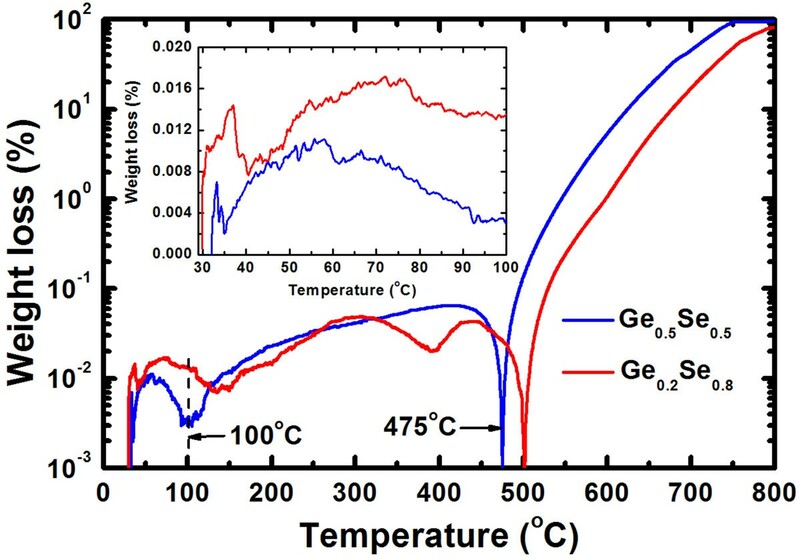 This results from the better thermal stability of the Ge0.5Se0.5 switching material. A Cu nanofilament diameter of 30 nm is also observed by high-resolution transmission electron microscopy (HRTEM) under SET conditions in the 150 × 150 nm2 memory device. The Al/Cu/Ge0.5Se0.5/W memory device can be operated with a low CC of 1 nA, an appropriate value for future atomic-scale devices on the scale of 0.25 Å.
Eight-inch-diameter Si (100) wafers were first cleaned using the standard Radio Corporation of America process, and an approximately 200-nm-thick SiO2 layer was deposited onto the wafers. A bottom electrode (BE) made of W or TiN metal was then deposited onto the SiO2/Si substrates. The BE thickness was approximately 100 nm. To design the memory devices, a SiO2 layer of thickness approximately 150 nm was deposited on the upper surface and developed by optical lithography over an active area of 150 × 150 nm2. A Ge0.5Se0.5 film with a nominal thickness of 40 nm was then deposited onto the active regions using an electron gun and pure Ge0.5Se0.5 granules. The chamber vacuum was 5 × 10−6 Torr prior to deposition. A slow deposition rate of approximately 2 Å/s helped to control the deposited thickness precisely. A Cu metal layer of nominal thickness 40 nm was deposited using a thermal evaporator, to serve as a top electrode (TE). A 160-nm-thick layer of Al was then deposited, using the same thermal evaporator, to protect the Cu surface from oxidation at high temperatures. The total TE thickness (Cu + Al) was approximately 200 nm. We investigated the resistive switching mechanism by comparing different TEs, made of Al, W, or IrO x . Finally, a lift-off process produced the resistive switching memory devices in an Al/Cu/Ge0.5Se0.5/W structure (device type, S1). We compared them with similar devices made using an Al/Cu/Ge0.2Se0.8/W structure (device type, S2). The Ge0.5Se0.5 and Ge0.2Se0.8 materials were characterized by XPS. After deposition, the Ge0.5Se0.5/W (or Ge0.2Se0.8/W) sample was transferred immediately to the analyzing XPS vacuum chamber (1 × 10−9 Torr). A film of nominal thickness 10 nm was etched out from the surface before taking the spectra. The analysis area had a diameter of 650 μm. All spectra were calibrated using a reference C 1s peak at 284.6 eV. Figure 1a shows the XPS spectra of Ge 3d core-level electrons. In the case of the Ge0.5Se0.5/W samples, the peak binding energy of Ge 3d core-level electrons was 30.1 eV, higher than that of the pure Ge 3d peak (29 eV) . This suggests that the Ge 3d peak centered at 30.1 eV represents the GeSe composition. The GeSe x spectrum shows a GeSe peak centered at 30.2 eV and a GeSe2 peak centered at 30.8 eV. The GeSe x peak has a higher binding energy owing to the higher binding energy of Se 3d core-level electrons. Consequently, the binding energy of the Ge0.2Se0.8 films increases to 31.1 eV. Figure 1b shows the XPS spectra of the Se 3d core-level electrons. For the Ge0.5Se0.5/W sample, the peak binding energy of Se 3d electrons is 54.2 eV, lower than the Se 3d peak (55.2 eV). The peak binding energy of GeSe2 is 54.7 eV, and the corresponding binding energy of Se 3d core-level electrons in the Ge0.2Se0.8 film is approximately 54.8 eV. However, the chemical shift of Se 3d (55.5 eV) electrons is −1 eV for GeSe2. The increase in binding energy with increasing Se content allows us to confirm the higher Se content in the GeSe x film [39, 40]. XPS spectra. (a) Ge 3d and (b) Se 3d core-level electrons for Ge0.5Se0.5and Ge0.2Se0.8solid electrolytes. The thicknesses of the resistive switching material and of the memory device were evaluated from a HRTEM image. HRTEM was carried out using a FEI Tecnai G2 F-20 field-emission system (FEI Co., Hillsboro, OR, USA) with an operating voltage of 200 kV and a resolution of 0.17 nm. A molybdenum (Mo) grid was used for TEM observations. Memory characteristics, such as current–voltage (I-V) relations, endurance, and data retention were measured using an HP4156C semiconductor parameter analyzer (Agilent Technologies Inc., Santa Clara, CA, USA). Charge-trapping phenomena were observed by capacitance-voltage (C-V) measurements using the HP4284A LCR meter (Agilent Technologies Inc.). The frequency applied during the C-V measurement was 1 MHz. The capacitance was measured in parallel capacitance-conductance mode. For electrical measurements, the bias was applied to the TE while the BE was grounded. More than 100 devices were measured at random to assess the uniformity of the memory characteristics. where b is the bowing parameter, assumed to be zero here for simplicity. The energy gaps of Ge and Se are 0.67 and 1.74 eV, respectively . Equation 1 gives E g approximately 1.21 and 1.53 eV for the Ge0.5Se0.5 and Ge0.2Se0.8 films, respectively. Assuming electron affinities χGe = 4.0 eV and χSe = 2.02 eV for Ge in the Ge0.5Se0.5 and Se in the Ge0.2Se0.8 films, respectively, the corresponding energy band diagrams of the S1 and S2 structures are shown in Figure 3. With a positive bias on the TE (0 < +V < VSET), the barrier height (0.75 eV) for hole injection at the Cu/Ge0.5Se0.5 interface is lower than that for electron injection at the Ge0.5Se0.5/W interface (0.91 eV, Figure 3a). With a negative bias on the TE (after RESET), the barrier height (0.3 eV) for hole injection at the W/Ge0.5Se0.5 interface is lower than that for electron injection (0.46 eV) at the Cu/Ge0.5Se0.5 interface in the Cu/Ge0.5Se0.5/W structures. In the Cu/Ge0.2Se0.8/W structures, the barrier height for hole injection is approximately zero compared to that for electron injection (Figure 3b). Therefore, the observed leakage currents are due to hole, rather than electron, injection. We also investigated the leakage currents using different electrodes, such as Al, TiN, and IrO x , in Ge0.5Se0.5 film, with results shown in Figure 4. The leakage currents for the Al/Ge0.5Se0.5/W, W/Ge0.5Se0.5/W, W/Ge0.5Se0.5/TiN, and IrO x /Ge0.5Se0.5/W devices were approximately 11.8, 11.2, 764, and 1,550 pA at +2 V, respectively, and approximately 22.4, 10.1, 6.7, and 173 pA at −2 V, respectively. The differences in leakage currents can be explained by considering the differences in the work functions of the metal electrodes (ΦTiN = 4.42 eV , ΦAl = 4.28 eV , and ΦIrOx = 5 eV ). For the W/Ge0.5Se0.5/W devices, the leakage currents at both polarities are nearly the same (11.2 and 10.1 pA) because they share the same W electrode. Due to the lower Φ m of the TiN BE, the leakage current is greater at +2 V than at −2 V for the W/Ge0.5Se0.5/TiN and IrO x /Ge0.5Se0.5/W devices (764 > 6.7 pA and 1,550 > 173 pA, respectively). The leakage current for the IrO x electrode is greater than for the Al, TiN, and W electrodes (173 > 22.4, 10.1, and 6.7 pA) because of the inertness of IrO x and Ir metal. On the other hand, the physical thickness of the switching material can be increased because of the reactivity of the Al, TiN, and W TEs during the deposition process. The leakage currents in all devices were measured by sweeping the voltage over ±20 V. However, resistive switching characteristics were not observed. On the other hand, all devices involving Cu electrodes show formation-free bipolar resistive switching characteristics (Figure 2), implying a 100% yield for this Al/Cu/Ge0.5Se0.5/W device. This suggests that the Cu electrode plays a key role in achieving such a good resistive switching behavior, as explained below. Typical I - V hysteresis of the Al / Cu / Ge 0.2 Se 0.8 / W and Al / Cu / Ge 0.5 Se 0.5 / W memory devices. Schematic energy band diagrams of (a) Al/Cu/Ge0.5Se0.5/W and (b) Al/Cu/Ge0.2Se0.8/W structures. Leakage currents for different electrodes made of Al, W, TiN, and IrO x . Average values (standard deviation (SD)) of VSET for the S1 and S2 devices were 0.61 V (0.08 V) and 0.24 V (0.06 V), respectively (Figure 5). In addition, the average values (SD) of VSET for the Cu/Ge0.3Se0.7/W and Cu/Ge0.4Se0.6/W devices were also 0.36 V (0.04 V) and 0.48 V (0.07 V), respectively. The average VSET increases with increasing Ge content in the Ge x Se1 − x solid electrolyte because the lower concentration of defects hinders the migration of Cuz+ ions and also because the barrier height for holes at the Cu/Ge0.5Se0.5 interface (0.75 eV) is greater than at the Cu/Ge0.2Se0.8 interface (0 eV). In essence, GeSe represents an archetypal chalcogenide glass-forming system, whereas Ge and Se atoms are predominantly four- and two-coordinated, respectively [47, 48]. However, Se is one of the most important semiconductors and has an unusual crystal structure, consisting of chains and rings of two-coordinated Se atoms. The addition of Ge creates Ge-Se heteropolar bonds that constitute GeSe4 tetrahedra [47, 49]. According to the phase-separated model, the stoichiometric glass consists of Se-rich and Ge-rich clusters. However, a Se-rich cluster is visualized as a two-chain-wide fragment of the layer structure of α-GeSe2 bordered by Se-Se bonds, whereas a Ge-rich cluster consists of ethane-like units . The presence of Se-rich clusters in the glass produces a less compact structure with a significant concentration of distorted tetrahedra. Considering both the floppy-type glass and the energy band diagram of the Ge0.2Se0.8 film, the average VSET of <0.24 V is small, as reported by several researchers [19, 21, 37]. Due to the absence of a barrier for hole injection at the Cu/Ge0.2Se0.8 interface and in floppy-type glass, uncontrolled Cu migration can occur even at low VSET and with a low CC of 1 nA (discussed later). A lower VSET is undesirable for memory circuit design because it narrows the read margin and can cause error. However, the larger VSET of 0.61 V obtained for the Al/Cu/Ge0.5Se0.5/W structure, a value of great interest for applications, has not been reported to date. 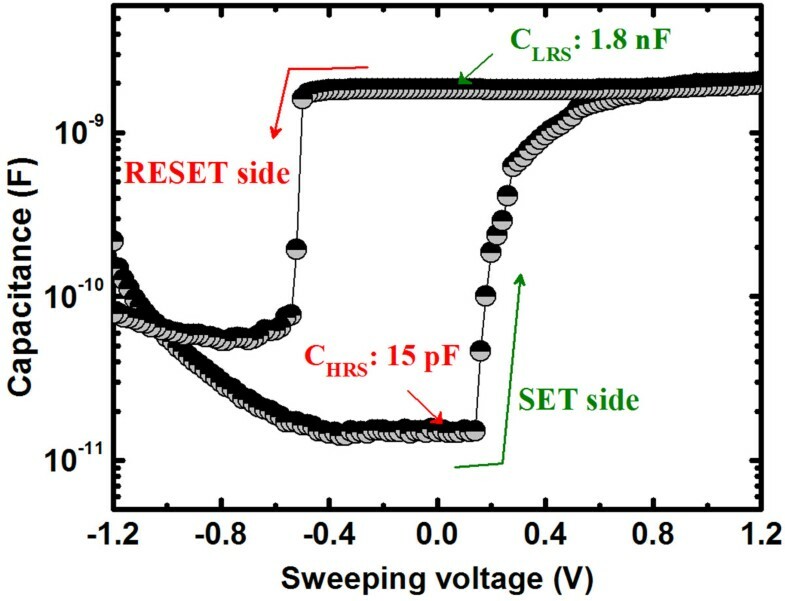 Under SET conditions (+V > VSET), the HRS switches to the LRS through the formation of a Cu metallic nanofilament in the solid electrolyte (Figure 2). In this case, the positively charged Cuz+ ions (or holes) migrate toward the W BE and take electrons from the W BE, resulting in the growth of a conical Cu nanofilament from the W BE in the Ge x Se1 − x solid electrolyte through electrochemical reduction (Cuz+ + ze– → Cu, Figure 6a). Due to the smaller barrier height for holes, Cuz+ ions, rather than electrons, migrate. Consequently, the device sets in a LRS. Under RESET conditions (−V < VRESET), the LRS switches back to the HRS through the dissolution of the Cu metallic filament at the Cu/Ge x Se1 − x interface, by electrochemical oxidation (Cu → Cuz+ + ze–, Figure 6b). This results from the higher electric field at this interface, caused by the high resistance at the neck of the conical Cu nanofilament. The kinetics of filament formation in these Ge x Se1 − x solid electrolytes is different from oxide-based materials reported elsewhere [34–36]. We note that the Cuz+ ions can migrate through porous regions in the solid electrolyte or via defects. Therefore, defective solid electrolytes or high-κ materials can be used to produce such a resistive switching behavior. We performed C V measurements on a defective solid electrolyte. Figure 7 shows typical C V hysteresis characteristics when sweeping voltages as −1.5 V → +1 V → −1.5V. The capacitances in the HRS (CHRS) and LRS (CLRS) are approximately 15 pF and 1.8 nF, respectively, at a read voltage of 0.06 V. C V hysteresis is caused by charge trapping, likely due to Cuz+ ions moving through the defect sites or being trapped in the Ge x Se1 − x solid electrolyte. Cumulative probability of SET voltages for the S1 and S2 devices. Schematic views of the filament (a) formation and (b) dissolution under SET and RESET operations. Charge-trapping phenomena. Observed by C-V measurement, proving the migration of Cuz+ions via defects in the Ge x Se1 − x solid electrolytes. To investigate Cu nanofilament formation, we prepared a typical Al/Cu/Ge0.2Se0.8/W memory device for TEM observation. Before performing the TEM measurement, the memory device was characterized with 6,000 program/erase (P/E) cycles. Finally, the memory device was kept in the SET condition. The P/E current and pulse width were 500 μA and 500 μs, respectively. Cuz+ ion migration and filament formation are clearly apparent in Figure 8. The device size is approximately 150 × 150 nm2 (Figure 8a). The thicknesses of the Al, Cu, and GeSe films are approximately 160, 40, and 38 nm, respectively. The Ge0.2Se0.8 film in the filament region appears crystalline owing to Cuz+ ion migration and Cu filament formation under SET conditions (Figure 8b), which is also investigated by fast Fourier transform (FFT) image. Amorphous Ge0.2Se0.8 film is shown at the without-filament region (Figure 8c). The d spacing in the Cu electrode and filament regions is found to be approximately 6.94 and 6.51 Å (or 6.54 and 7.02 Å), respectively (Figure 8d,e,f), which is larger than our previous reported d spacing of Cu (111) (d approximately 2.087Å) . The d spacing of Se was reported to be 5, 3.7, and 2.9 Å that correspond to the (001), (100), and (101) planes, respectively . Those values are also lower than that observed values in the TEM image (Figure 8b). On the other way, considering the interplanar spacings d1 and d2 of two overlapping crystals, the d spacing of parallel moire’ fringes will be increased . Even though the Cu will be mixed in the Ge0.2Se0.8 in the filament region, however, the d spacing of Cu will be also increased, which may be overlapping of different Cu nanocrystal fringes or Cu and GeSe nanocrystal fringes. Therefore, a crystalline Cu (or Cu/GeSe mixture) nanofilament is observed. Further study is needed to understand clearly the lattice fringes in the filament. The Cu filament diameter (approximately 30 nm) in the Cu/Ge0.2Se0.8/W device is larger than that (approximately 11 nm) in the Cu/Ge0.4Se0.6/W device , owing to the less controlled migration of Cu ions in Ge0.2Se0.8 than in Ge0.4Se0.6, and as a result of the lower barrier for hole injection. All layers of W, Ge0.2Se0.8, Cu filament, and Cu are confirmed in EDX spectra (Figure 8g). 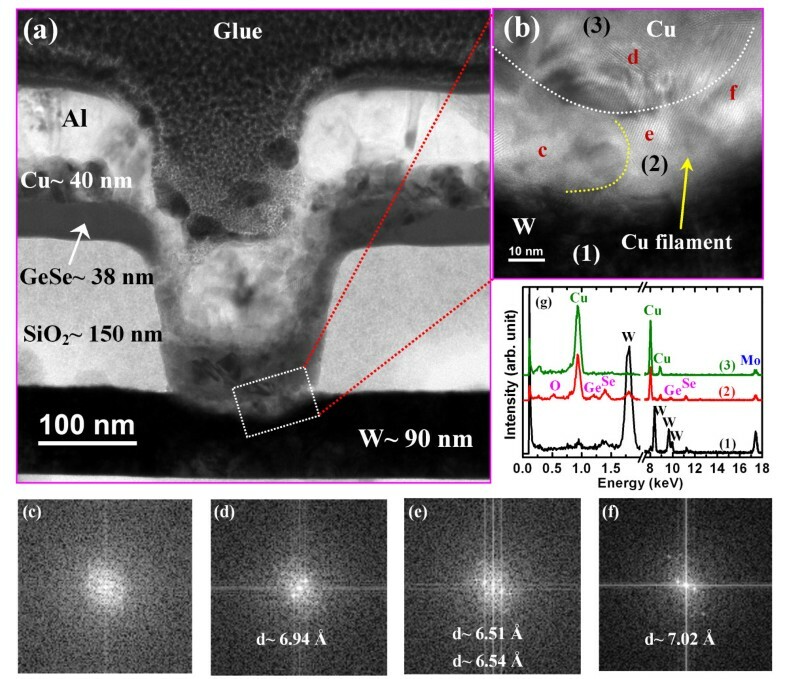 A strong Cu signal is observed in the crystalline region due to the formation of Cu clusters or a Cu nanofilament within the Ge0.2Se0.8 solid electrolyte. There are two main diffusion mechanisms, one involving fast transport via interstices and a slow one by substitution. However, Cuz+ ions are highly mobile in chalcogenides and can also migrate rapidly as interstitial species until they encounter a vacancy, where substitution then occurs [52, 53]. Therefore, the defects also play a role in the controlled formation and dissolution Cu filament through the solid electrolyte. Cu z + ion migration and filament formation. (a) HRTEM image of an Al/Cu/Ge0.2Se0.8/W resistive memory device after 6 × 103 P/E cycles and the device kept in SET condition. (b) The diameter of the Cu filament is approximately 30 nm. (c) Amorphous Ge0.2Se0.8 film is observed at the without-filament region by FFT. (d) FFT in Cu electrode. (e) to (f) Crystalline Cu filament is observed. (g) EDX analysis at the points indicated in (b). The numbers (1), (2), and (3) indicated in (b) correspond to the EDX analysis positions. The structural flexibility of films with a higher Se content produces large variations in the HRS (Figure 9a) after few cycles, owing to the easier migration of Cu under the SET operation, which results in a higher RESET current (4.5 vs. 0.14 μA), as shown in Figure 2. However, a good DC endurance with a stable resistance state and a high resistance ratio of >104 at a CC of 8 μA was observed in the high-Ge-content devices (S1). This results from the limited migration of Cu under the SET operation or from the controlled Cu nanofilament diameter under SET and RESET operations. The S1 memory devices show stable AC program/erase endurance, as shown in Figure 9b. The applied P/E current and pulse width were 500 μA and 0.5 ms, respectively. The programming and erasing voltages were set to +1.1 and −1.0 V, respectively, and the read voltage was 50 mV. The S1 devices were robust over >106 P/E cycles, while the S2 devices showed inferior P/E cycles (they failed after 105 cycles). Continuous P/E cycles can heat up the S2 devices, and hence, Se atoms may out-diffuse (or voids may be created in the Ge0.2Se0.8 solid electrolyte), resulting in device failure. Well-controlled Cu nanofilament formation and dissolution under the SET and RESET operations of the S1 devices has the advantage of long P/E cycles. Robust data retention characteristics at 85°C are shown in Figure 10. The P/E current was 300 μA. The S1 devices yield HRS (approximately 27.6 MΩ) and LRS (approximately 1 kΩ) both stable over >105 s at 85°C, while the S2 devices yield stable HRS (0.5 GΩ) and unstable LRS (initially, 0.9 kΩ). 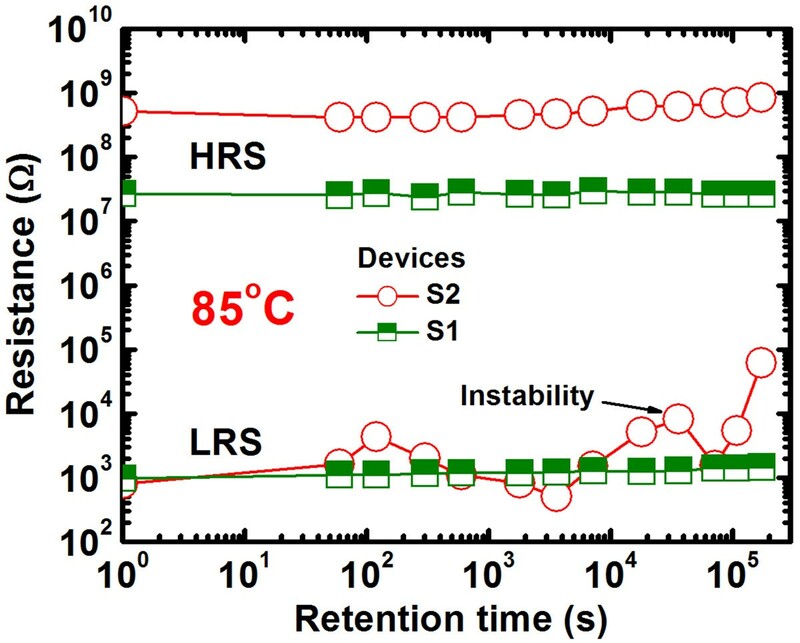 This suggests an inferior thermal stability of Ge0.2Se0.8-based resistive switching memory devices. Figure 11 shows the weight loss of the switching materials as a function of temperature, obtained from thermo-galvanometric measurements. The temperature increases at a rate of 10°C/min. The flow rate of Ar was 200 ml/min. The weight loss of Ge0.2Se0.8 material is greater than Ge0.5Se0.5 material (1.3% vs. 0.3% at 100°C) because of the lower melting point of Se, as shown in the inset of Figure 11. This suggests that the Se atoms are reduced in the S2 devices at 85°C during data retention measurements, which destabilizes the LRS. Above 100°C, Ge0.5Se0.5 loses weight slowly and evaporates rapidly above 475°C, the melting point of Ge0.5Se0.5. Bruchhaus et al. reported a thermal stability for Ge0.4Se0.6 up to approximately 450°C. Therefore, the high-Ge-content Ge0.5Se0.5 solid electrolyte is preferable for future nanoscale nonvolatile memory applications. Resistance states. 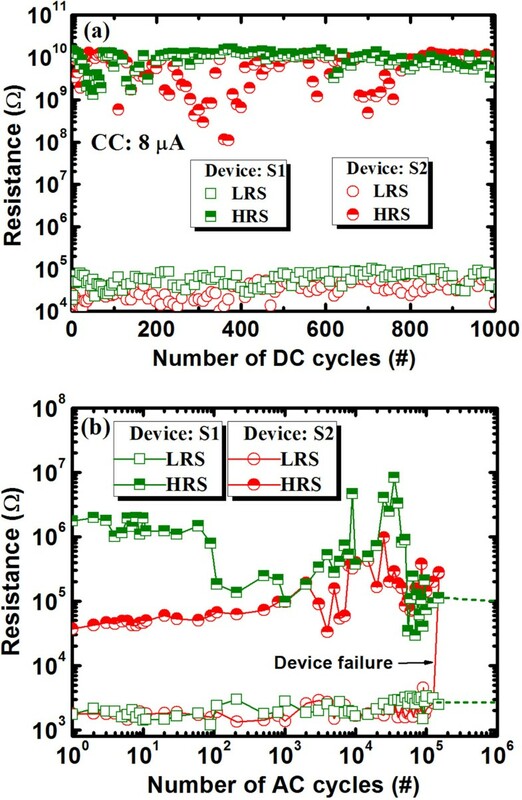 (a) The resistance states with DC cycles of the S1 and S2 devices. (b) AC endurances of approximately 105 cycles are observed for both devices. However, the Ge0.5Se0.5 devices (with more Ge content) are more stable. Stable retention characteristics over >2 days at 85 ° C. Obtained for the Ge0.5Se0.5device as compared to the Ge0.2Se0.8 device. Weight loss of the Ge0.5Se0.5and Ge0.2Se0.8switching materials. The Ge0.5Se0.5 material shows lower loss below 100°C, indicating that a higher Ge content enhances thermal stability. This memory device can be also used for low-power operation. Figure 12a shows the I V hysteresis characteristics for a small CC of 1 nA in the S2 devices. However, the RESET current of approximately 1 μA is high, owing to the very strong migration of Cu in the Ge0.2Se0.8 solid electrolyte, even for a small CC of 1 nA, or to an overshoot effect . This will make the scalability of Ge0.2Se0.8 devices more challenging. The higher RESET current makes the Cu filament diameter strong, thereby producing good data retention over >30 min, as shown in Figure 12b. On the other hand, the repeatable resistive switching memory characteristics with a small CC of 1 nA and a small RESET current of 64 pA are also observed in the S1 devices (Figure 12c). The lower RESET current is due to the thinner Cu nanofilament caused by the controlled migration of Cuz+ ions through the higher hole-injection barrier. These devices also show retention characteristics over a few minutes at a small CC of 1 nA (Figure 12d). However, the current at LRS decreases slowly after 100 s of retention time, which is probably a thinner filament diameter. The LRS and HRS have approximately 20 MΩ and approximately 30 GΩ, respectively, at a read voltage of +0.2 V (Figure 12c). The high VSET and the large resistance ratio of >102 will be useful for future logic memory design. However, lower SET and RESET powers are 0.61 nW and 6.4 pW, respectively. Considering the resistivity (ρfilament approximately 200 μΩ cm ) of the Cu filament, the diameter for a small CC of 1 nA is approximately 0.25Å, indicating potential scalability beyond the atomic scale. By considering a low operation current of 1nA, an even denser memory of 1,300 Pbit/in2 could be designed in the future. I-V hysteresis and data retention. (a) Typical I-V hysteresis for the S2 device with a low CC of 1 nA. However, a high RESET current of 1 μA is observed owing to the faster migration of Cuz+ ions or a larger Cu filament diameter. (b) Good data retention is observed in the S2 devices for a CC of 1 nA. (c) Typical I-V hysteresis for the S1 devices. The observed low RESET current of approximately 64 pA is due to the controlled migration of Cuz+ ions. (d) Typical data retention characteristics at a small CC of 1 nA for a device size of 8 × 8 μm2. 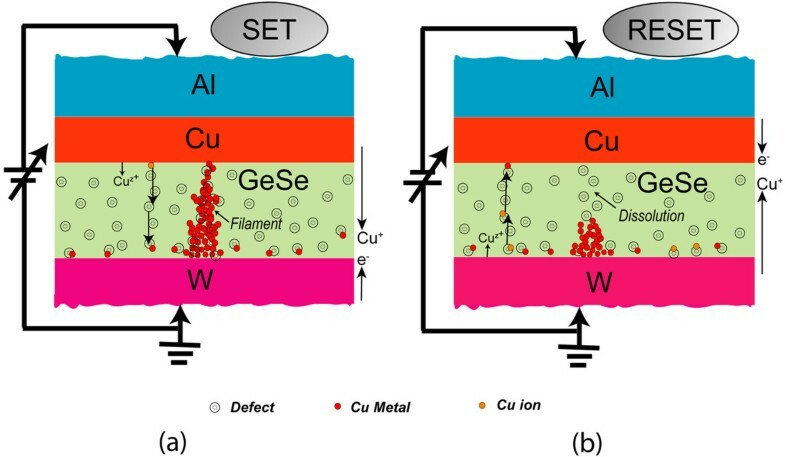 We investigated the superior and repeatable bipolar resistive switching memory characteristics of an Al/Cu/Ge0.5Se0.5/W structure, as compared to an Al/Cu/Ge0.2Se0.8/W structure, with a small operating voltage of ±1.5 V. The composition of the switching materials was confirmed using both EDX and XPS. We demonstrated a nanoscale memory device with a size of 150 × 150 nm2, as confirmed by HRTEM. This Al/Cu/Ge0.5Se0.5/W memory device has a higher VSET of approximately 0.6 V, a stable endurance over >105 cycles, and shows excellent data retention characteristics over a time of >105 s at 85°C and a large resistance ratio of >104. 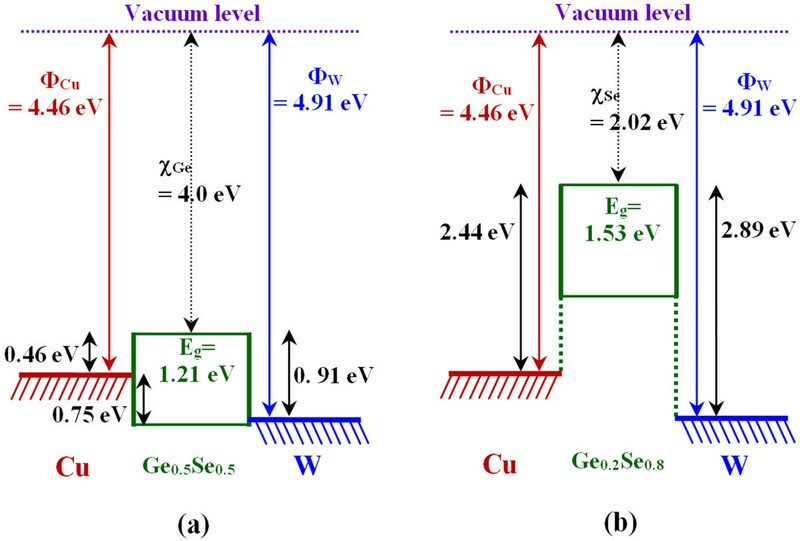 A lower barrier height for hole injection than for electron injection helps the propagation of the Cuz+ ions and the initiation of growth and dissolution at the Ge0.5Se0.5/W and Cu/Ge0.5Se0.5 interfaces, respectively. The migration of Cuz+ ions, via defects, into the Ge x Se1 − x solid electrolyte explains the basic switching mechanism. The Cu nanofilament with a diameter of 30 nm is also observed by HRTEM under SET. The Al/Cu/Ge0.5Se0.5/W device can be operated with a current as low as 1 nA. Furthermore, the SET and RESET powers are small at 0.61 nW and 6.4 pW, respectively. 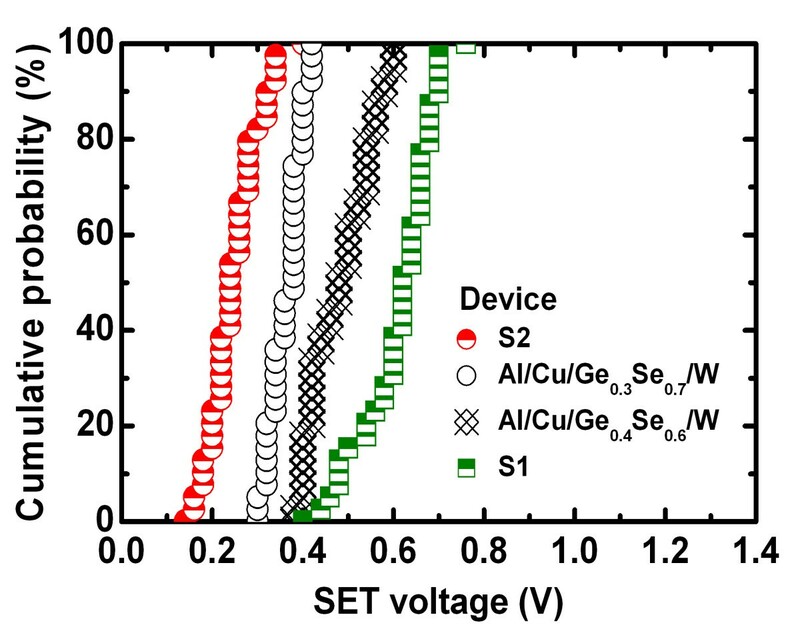 This suggests that the solid electrolyte Ge0.5Se0.5, with a higher Ge content, in an Al/Cu/Ge0.5Se0.5/W structure paves the way to future atomic scale (<1 Å) nonvolatile memory applications. This work was supported by the National Science Council (NSC), Taiwan, under contract numbers NSC-98-2923-E-182-001-MY3 and NSC-101-2221-E-182-061. The authors are also grateful to MA-tek, Hsinchu for their HRTEM support. SZR carried out the fabrication of the CBRAM device, measurement, and data analysis under the instruction of SM. AD and AP helped deposit the GeSe films under the instruction of SM. YHW helped partially fabricate the device under the instruction of SM. CSL and LBC provided the device fabrication facility. TCT performed the XPS measurement and analysis. WSC, HYL, FTC, and MJT contributed to the via structure design. All the authors contributed to the preparation and revision of the manuscript, approved it for publication, and read and approved the final manuscript.